Epoxy coatings are recommended for use when a high-performance, chemically resistant coating is desired. It is a highly durable floor and provides protection for the concrete beneath it, preventing materials that might crack or penetrate it from its base over time. 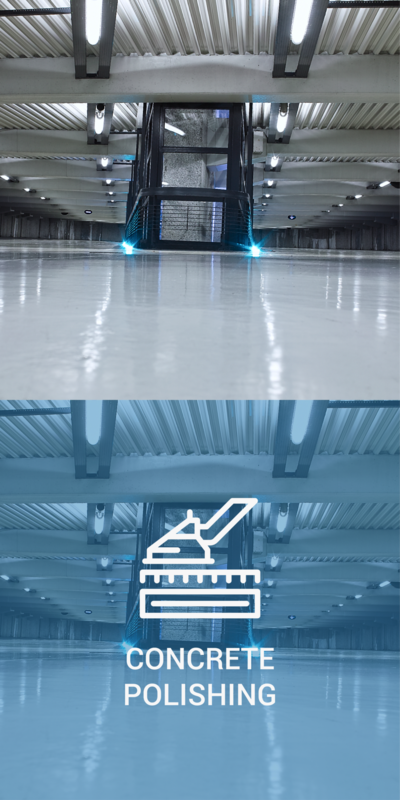 This type of floor can be applied to all types of heavy use industrial applications, such as airplane hangars, parking decks, manufacturing, schools, etc. There is a wide variety of epoxy and urethane flooring systems available for varied industrial or commercial applications. We are highly experienced in providing these flooring solutions and will be able to advise you on the most suitable type of epoxy or urethane flooring for your unique application. This type of epoxy provides a thin coat of epoxy resin over concrete, in order to protect the concrete and provide an easily cleaned and professional looking surface in a variety of colors. Epoxy Quartz flooring consists of several layers of clear epoxy resin that has colored quartz sand embedded in it for a decorative floor and has a high gloss, chemical resistant, clear top-coat for protection. Epoxy Flake flooring is a decorative epoxy flooring consisting of a layer of epoxy resin that has colored vinyl flakes embedded in it, covered by a high gloss, chemical resistant, clear top coat for protection. Urethane Concrete is a heavy duty polyurethane flooring system that is perfect for demanding industrial environments. MMA floors are some of the quickest resin flooring options to install, with full curing times of only 1-2 hours, which is perfect if you must resurface your floor quickly, with minimal down-time for your business.